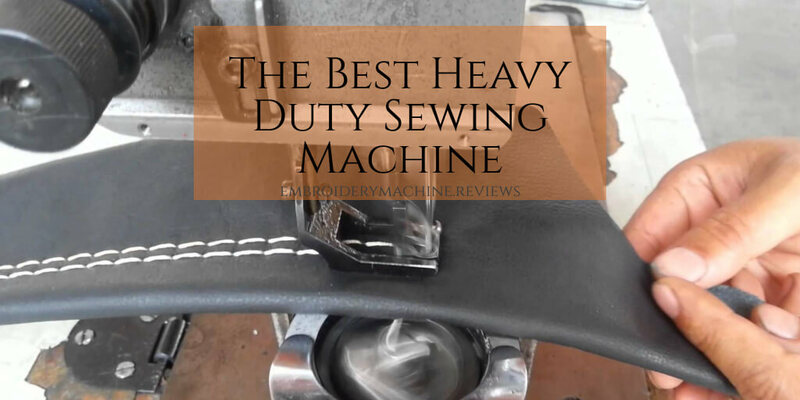 What’s the Best Heavy Duty Sewing Machine? Should You Invest in a Heavy Duty Sewing Machine? What Should You Look for in a Heavy Duty Sewing Machine? Have you noticed your sewing machine shuddering and shaking when you try to stitch heavy duty fabrics? Does it give off steam and struggle to get through the task? Many sewing machines available these days are just not sturdy enough to deal with quilting, denim or drapes. While they are sufficient for hobbies or lightweight fabrics, when put to the test on a heavier fabric, they cannot take the pace. If you are finding that this applies to you, investing in a heavy duty sewing machine could be the way to go. When we think of sewing machines, Singer is certainly one of the first names that springs to mind. The company has been producing quality sewing machines since the late 1800s. This heavy duty machine is one of the many it offers. This machine weighs 17.42 pounds. It measures 15.2 by 12 by 6 inches. It has a heavy duty metal frame which supports all the internal mechanisms. It is both stable and durable, even when dealing with the heaviest fabrics. With 32 stitches built in and an adjustable stitch length to a maximum of 0.24 inches, you have plenty of choice. These include stretch stitches, buttonhole stitches, and decorative stitches. This allows you to use the machine for any number of projects, including garments, quilts, home decor, and crafts. The machine is easy to thread. The threading instructions are printed on the machine. An added bonus is the automatic needle threader. This saves you time and effort, as you don’t have to spend ages trying to get the thread through the small hole. An 1100 sewing speed of stitches per minute lets you complete projects quickly. The powerful motor ensures that this speed is maintained, even on fabrics like denim and canvas. A stainless steel bed plate makes sure your fabric glides through the machine with ease. This gives you even stitches every time. The bobbin drops in from the top and has a transparent cover. You can easily monitor the thread supply from the bobbin and see when it’s getting low. There is an extra high lifter on the presser foot, to allow for thicker fabrics. The machine also comes with four different presser feet. An all-purpose foot for general sewing needs, a buttonhole foot, a zipper foot, and a button sewing foot. This Singer machine also has a built-in lever to set the stitches to reverse. This is perfect for when you want to reinforce what you have sewn. There is a built-in light to make it easy to see your work. A number of accessories are included with the machine. These are a lint/seam-ripper brush, quilting/edge guide, bobbins, needles, and a screwdriver. There is also spool-pin felt, an auxiliary spool-pin, foot controller and a soft-sided dust cover. It comes with a quick start guide and full instruction manual. The company offers a 25-year limited warranty on this heavy duty machine. This YouTube video highlights some of the features of the Singer 4432. Plastic casing and knobs can make it feel cheap. Can be hard to maintain a slow speed on the foot control. 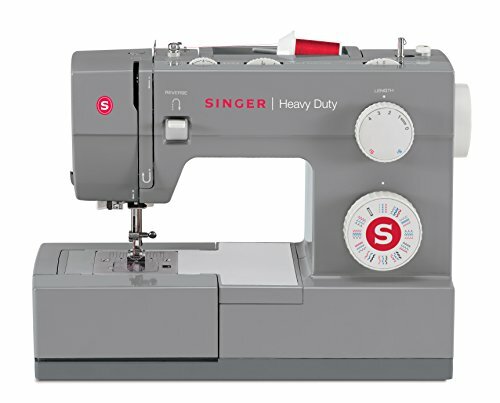 Should You Buy The Singer 4432 Heavy Duty Sewing Machine? As an entry level, affordable heavy duty machine, this fits the bill. It can cope with several layers of heavy-duty fabrics, such as denim. There are many stitch options to choose from, including a one-step buttonhole. A fast, powerful motor will allow you to complete projects quickly while the machine remains stable. There are some negatives with this machine, one being the plastic outer casing. Although the machine is durable and sturdy, this makes it feel a little on the cheap side. The speed of the machine is great as long as you can control it; it might be a bit too fast for some. Janome is one of the newer kids on the block when it comes to sewing machines. However, the firm has built a reputation for producing high quality, user-friendly machines. The HD3000 is no exception to that. While basic, it is a reliable heavy-duty sewing machine, suitable for beginners and the experienced alike. This machine weighs in at 18.7 pounds and measures 16 by 11.3 by 7.5 inches. The body is manufactured from heavy duty aluminum making it sturdy and durable. The machine can sew 18 different stitches, including a one-step buttonhole. There is a handy guide printed in the top tray of the machine, showing which stitch settings and presser feet to use for a number of sewing tasks. Both the length and the width of the stitches can be adjusted via sliders located on the front of the machine. The maximum stitch width is 0.25 inches and maximum stitch length 0.16 inches. The stitch speed per minute is 860. It has a five piece feed dog to move your fabric seamlessly through the machine while sewing. The bobbin is easy to insert and remove and has a clear cover. The machine has a free arm so you can expand your sewing space and manipulate fabrics with ease. The extra high presser foot allows you to sew even the thickest fabrics. Denim, leather, vinyl, and canvas can all be sewn as easily as silks and thin knits. Threading the machine is straightforward and there is also an automatic needle threader. The built-in light illuminates your stitching area so you can see what you are sewing. Reverse stitching allows you to reinforce seams or other stitches when you need to. The machine is supplied with its own hard case and other accessories. These include six different feet: buttonhole, zig-zag, button, blind hem, rolled hem and overedge. There are also many other accessories available to purchase for use with this machine. Complete the warranty registration card in the package and the manufacturer provides a 25-year limited warranty. This YouTube video shows the Janome HD3000 in action. Excellent for beginners and experienced machinists. Sturdy aluminum frame inside a hard plastic casing. Free arm to extend workspace. Stitches easily through many layers of thick fabric. May be too basic for some. Price point is higher than some comparable heavy duty machines. 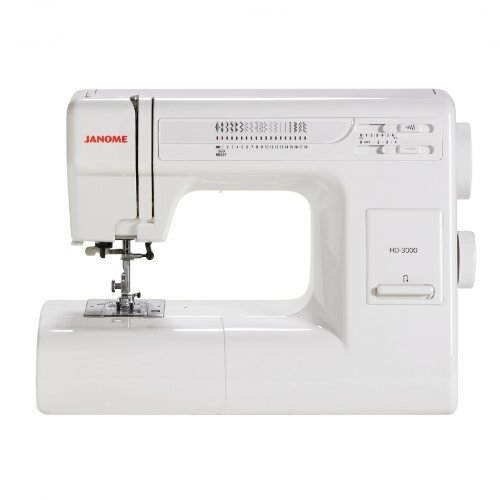 Should You Buy The Janome HD3000 Heavy Duty Sewing Machine? This machine is described by many as a workhorse, and that has been my experience. Its solid frame keeps it stable when stitching, and dealing with thick fabrics, even in many layers, is a piece of cake. The stitch options and adjustments are sufficient to sew many projects. The free arm extends your workspace and lets you easily stitch around hems on trousers or sleeves. Some find this machine too basic, but that being said, many experienced users love its simplicity. Juki is a Japanese company that manufactures several industrial sewing machines. It has brought this expertise to the market for household models. They are known for their high quality and ease of use. The 2000Qi is a heavy duty machine suitable for sewing across a range of projects. This machine has an aluminum die-cast frame, giving it both durability and stability. It measures 17.8 inches by 13.8 inches by 8.6 inches and weighs 37 pounds. It is a single needle lockstitch machine, suitable for straight stitching and quilting. It is supplied with an extended sewing area that can be attached when stitching larger pieces of fabric. Stitch speed is an impressive 1500 stitches per minute, controlled from the foot pedal. The thread tension can be altered via a convenient scale on the machine. Stitch length can be adjusted to a maximum of 0.24 inches, which is good for heavy duty fabrics and quilting. The bobbin is easy to load and there is an up/down needle control. The machine also has a knee, lifter lever, leaving your hands free when adjusting the presser foot. Threading the machine is easy and there is an automatic needle thread function. Sewing thick fabrics is made easy with the half-inch foot lift. There is also an automatic thread cutter to sever the ends once you finish stitching. Built-in LED lights help to make viewing your sewing easier. The machine comes with a 1/5-inch quilting foot, an even feed foot, and instruction manual. Juki offers a two-year limited warranty on electronic parts and a five-year limited warranty on some other parts. Extended workspace with supplied attachment. Might be a steep learning curve for some to get the settings right. 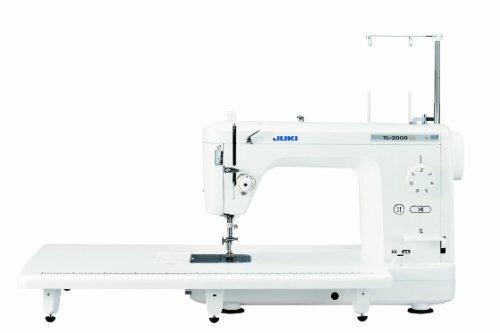 Should You Buy The Juki 200Qi Heavy Duty Sewing Machine? This machine has many positives. It really is heavy duty, being made of die-cast aluminum. It is stable, sturdy and durable. The machine has a clean appearance, being all white, and the tapered head gives you a clear view of your work. The stitch speed is fast and responsive, making it easy to speed it up or slow it down. It produces stitches that are straight and even every time. This short YouTube video shows you how fast this machine can stitch. The automatic thread cutter works with the foot pedal. Couple this with the knee lift for the presser foot and your hands are free to ensure your fabric is just where you want it. This machine can sew several layers of fabric like a knife cutting through butter. On the downside, all the settings are manual, so it may take a few attempts to get it right. However, it’s worth persevering until you do. While this machine is more expensive than the others we have reviewed, it seems to be worth the extra investment. It’s very popular with quilters who love the extra work space and the reliability of the machine. If you want to stitch heavy duty fabrics like denim, canvas or leather, a heavy duty machine is a good investment. It’s also worth considering for large projects like quilting. However, it’s not just limited to these factors. A heavy duty sewing machine is also a good idea if you do lots of sewing and want a stable, sturdy workhorse. The Singer is an excellent entry level machine. It has the functionality most sewing enthusiasts need and it’s affordable, compared to other heavy-duty machines. If your budget will stretch further, you should consider the Janome or the Juki. Either one will deal with the most arduous of sewing tasks. Their stitch speeds mean projects can be completed quicker, leaving you free to do other things or sew more. Whichever machine you choose, it will make sewing a breeze. Altering the drapes that are too big or hemming a pair of jeans that are too long will be easy. Whether or not you need a heavy duty sewing machine can depend on the sewing projects you plan to complete and the amount of sewing you do. Also, consider the level and range of your sewing skills. Even when you sew as a hobby, if you plan to complete large projects or do a lot of sewing, you will benefit from a heavy duty machine. They are built to withstand high volumes of work and heavy-duty fabrics. They can cope with larger sizes of material, like quilting or hemming drapes, as well as heavy duty fabrics like denim, suede or leather. You would be able to hem a pair of jeans or resize drapes that your lightweight machine just can’t deal with. Heavy duty sewing machines tend to be able to sew faster, too, so they will make quick work of even the most taxing project. Trying to complete a heavy duty project on a lightweight, compact machine can take hours. Not only that, as they are not meant for this purpose, it can make you feel like tearing your hair out. Your sewing room will turn into frustration central and you will, most likely, give up. The key to your success, if this scenario is familiar, is investing in a heavy duty sewing machine. Let’s look at some of the important features. Most heavy duty sewing machines will have either a partial or full metal frame. Some have a metal frame with plastic outer and others will be all die-cast metal. Some machines will also have metal working parts. Again, the more metal internal parts, the more durable the machine is likely to be. A heavy duty machine works harder to pass a needle through thicker fabrics. Consequently, it’s important to know how many stitches per minute, or SPM, it is capable of. Trying to complete the same task on a lightweight machine with a high amount of stitches per minute just won’t work in the same way. It will struggle to get the needle through the fabric which will slow it down. Make sure the machine you choose can stitch the type of fabrics you intend to use. If you plan to sew projects with leather, canvas or denim, double check the machine can deal with those materials. Investing in a heavy duty sewing machine is obviously going to cost you more money. You want to make sure that the one you choose is going to last. We’ve mentioned that they are made from metal. This is generally the frame and sewing plates, they might also have a plastic coating. As a result, they will be heavier and more stable than a lightweight machine. This means they’re less likely to move around when dealing with those heavy fabrics. Choosing the sturdiest machine that you can within your budget, will make sewing projects with denim, leather, and canvas a snap. Ease of threading needles is always a bonus when using a sewing machine. Not all machines are created equal and some are harder to thread than others. The chances are that the manufacturer will state it’s easy, then you get it home and spend hours trying to get it right. A good point of reference for this feature is customer reviews. It’s something many people comment on when reviewing sewing machines. However, even then, what one person finds easy, another may find hard. These comments will only give you an impression of how easy it actually is to thread. If you have past experience with sewing machines, this will be a bonus. You can call on your own experiences when making a choice. Heavy duty sewing machines can cost from a few hundred dollars up to many thousands of dollars. It’s a good idea to decide on your budget when you start looking. You can expect to pay about double the price that you would for a similar lightweight machine.